Grasslands, which comprise 14 percent of Alberta, offer some of our most scenic vistas. 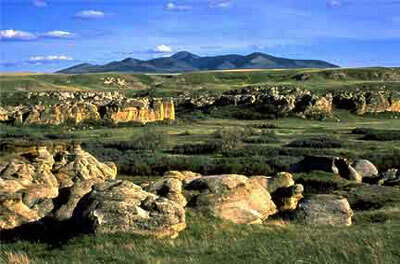 Located in Southeastern Alberta, grasslands are the most threatened of Alberta's six natural regions. The same long, hot summers that make this region too arid to produce forest give it a growing season ideally suited for field crops. Most years, there is enough spring meltwater and summer rain to met the needs of wheat, barley and other grain crops. Alfalfa, corn and a host of other more specialized crops also grow where the rivers have been tapped for irrigation farming. As a result, more than 80 per cent of Alberta's native grasslands have been plowed under and turned into cropland during the past century. Largely because of this habitat loss, more than half the species on Canada's endangered species list are prairie species. These include the burrowing owl, swift fox, ferruginous hawk, and the peregrine falcon. While remnants of native grasslands are mostly found in areas not suitable for farming, habitat restoration and the reintroduction of species like the swift fox lend to the idea that future generations will be able to visit these areas and see them as did Alberta's first inhabitants. Want to help protect the Rocky Mountains? Join or Make a Donation to an Organization that makes a difference.